Using ultrasonic sensors, the two new valve series offer shut-off, balancing and measuring functions all in a single valve. Image: KSB. KSB will present two new valve series which use ultrasonic sensors at this year’s ISH trade fair, which takes place from 10-15 March. The BOA-Control EKB and BOA-Control IMS EKB valve series are designed for use in drinking water supply systems, air-conditioning systems and cooling circuits. 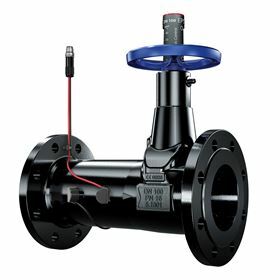 They offer shut-off, balancing and measuring functions all in a single valve. The valve series uses ultrasound waves and two sensors attached to the valve enable ultrasonic sensor measurement to record the flow rate via transit time difference measurement. The sensors can be attached in two different ways. The BOA-Control EKB is suitable for mobile ultrasound measurement and the sensors are attached to the valve body via a magnetic connector if required. This allows the flow rate to be consecutively measured on any number of valves using a BOATRONIC MS measuring computer and a set of sensors. The BOA-Control IMS EKB series has sensors permanently connected to the valve body. The computer continuously transmits the flow rate and temperature values via a 4 - 20 mA signal to a higher-level system. No additional measuring instrument needs to be installed in the pipe.